Monica Noh wants to trim the fat from the fashion equation. As the founder of Carte Blanche, the world's first womenswear label to use crowdsourcing as a way to empower its customers, the Parsons graduate is raring to create chic, wearable garments that involve less waste, increased quality, and heightened transparency. Noh, who cut her teeth designing for the likes of Ann Taylor and Kate Spade Saturday, also seeks to cut out the middleman, a tack that allows Carte Blanche to sell its dresses at their "true cost" rather than at four to eight times the markup. All styles are limited edition—meaning they're few of a kind—and made to order in New York City. We caught up with Noh to learn more about her brand of "slow fashion," why Kickstarter was the ideal launchpad for her business, and the changing relationship between designer and consumer. What inspired you to move from a corporate career to designing your own line? Working for larger fashion brands taught me how the industry goes about the design and production process. It struck me after a while that the design process hasn’t changed much in the past 10 to 15 years, while tech has dramatically changed the retail landscape. “I enjoy the process of collaborating with whomever I’m designing for,” Noh says. I’d always been interested in starting my own line, but I didn’t want to go about it in the traditional way. Competing against every other talented designer to get the few coveted spots in boutiques and department stores is essentially a zero-sum game, and I don’t think it’s suited to my personality. I was interested in exploring the ways technology could enable me to practice my values as a designer and create a more sustainable business model. Why did you choose to go the crowdsourcing route? I enjoy the process of collaborating with whomever I’m designing for. I like the feedback loop inherent in the crowd-sourcing model; I’m always learning which styles resonate most with my customers and adapting styles according to that feedback. People can also pre-buy the styles they want, and their credit cards aren’t charged until those styles hit their manufacturing minimums. You used Kickstarter to launch your campaign. How did that work? With Kickstarter, I was really curious to see which styles people would respond to, so people could buy each style individually or in packages of two, or even all five [styles]. Our most popular reward by far, with 30 backers, was the $300 reward, which included the Two-Way Zip Dress, plus one other style of the backer’s choice. For Season 2, Carte Blanche will be crowdsourcing on its own website, rather than on Kickstarter. For Season 2, we’ll be crowdsourcing on our own website, rather than using Kickstarter. I really wanted to launch Carte Blanche on a platform where users understand the crowdfunding model. I learned so much through the experience and can’t wait to launch Season 2 on our own website. What did you learn from the feedback you received? I thought it was really interesting that the Two-Way Zip Dress was so much more popular than the other styles. After asking a few different backers as to why they’d purchased that particular dress, I saw that there wasn’t a clear-cut reason across the board, but I do think there’s a real versatility to that style that lends itself to a lot of different body types and tastes. I’m currently doing research for Season 2 with that in mind! What was your inspiration for your inaugural collection? For the Kickstarter collection, I really thought about the five pieces I’d love to have in my closet that could take me to any event. I did over 200 sketches and edited them down to my favorites. What are the advantages and/or challenges of selling directly to your customer? Being able to sell direct to customer allows you to be a lot more agile than if you’ve got a showroom, a [public-relations] person, and a salesperson in between you and the customer. “It’s incredibly powerful to be able to interact directly with your customers,” Noh says. Today, with tools like Shopify and Etsy, anyone can start a direct-to-customer boutique for anything. It’s incredibly powerful to be able to interact directly with your customers, but customer acquisition is probably the most challenging aspect. Will the first season’s dresses be sold again or was it a one-time deal only? I’d like to re-release our best-sellers as items that can be bought anytime: a collection of our wardrobe essentials, really. For our Kickstarter collection, the Two-Way Zip Dress was by far our bestselling style, and I’ve received so many requests for this style in black and gray, so we’ll definitely see that style for Season 2. What’s in store for Season 2? More dresses or branching out into other options as well? Are accessories in the work? I’m currently building my inspiration board for Season 2, which will be another collection of dresses, but with a completely fresh perspective. Noh says she would love to expand into accessories and outerwear next. I’d love to expand into other categories, like accessories and outerwear, so I’m hoping to deliver those for Season 3. Will you still go with Kickstarter to make your selections? Or how will that process work? For Season 2, we’ll be launching our own crowdfunding platform on our website, www.carteblanche.ly. There, we’ll be able to tailor the experience so we can really showcase each style. Each style will have its own page, and users will be able to pre-buy the styles similarly to Kickstarter. Noh says she likes the "feedback loop" inherent to crowdsourcing. "I'm always learning which styles resonate most with my customers and adapting styles according to that feedback," she says. Noh launched Carte Blanche on Kickstarter as a way to gauge interest. 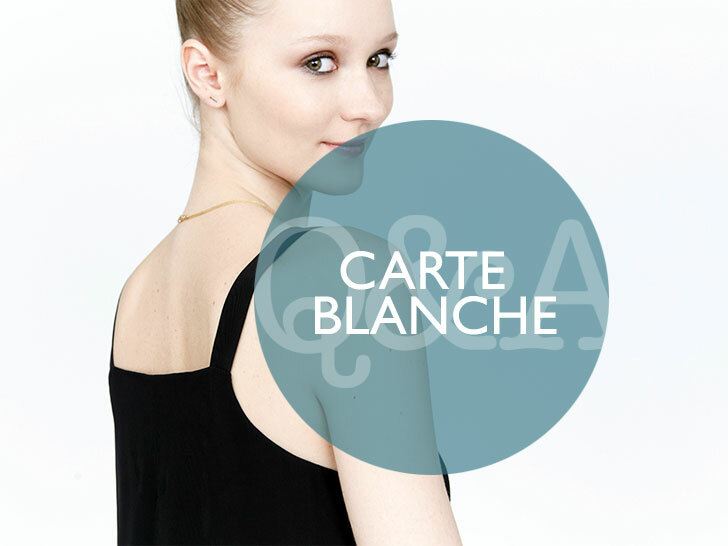 Following the wildly popular Season 1, Carte Blanche will be crowdsourcing subsequent seasons on its own platform. Noh says she enjoys the streamlined relationship she has with her customers, although she admits that client acquisition has its challenges. Don't fret if you missed on out Season 1. Noh expects to bring back popular styles in different variations.